It’s described as “the most anticipated ship of the year,” and with good reason as Celebrity Cruises’ new flagship, Celebrity Edge, is sure to be a game-changer in the industry. The 2,918-passenger Celebrity Edge is currently getting its finishing touches at the Chantiers de l’Atlantique shipyard in France and will debut in late November, homeporting in Fort Lauderdale and offering Caribbean sailings before moving to the Mediterranean next summer. 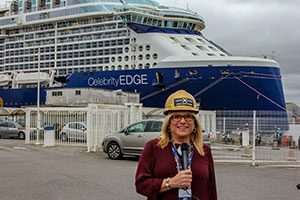 Celebrity recently hosted a by-invitation-only industry sneak peek and tour of the Edge in France, attended by top travel trade personnel and journalists from around the world, including Travel Courier’s Greg Coates. The ship certainly lived up to its billing. While about 95% complete at the time of the tour (and still a construction site), it was evident of the luxurious and unique experiences that lie ahead for Celebrity Edge cruisers. The attention to detail is evident throughout the ship – thanks much to its team of world-class designers – and from all accounts from those on hand, the Edge is impressive. “I’m amazed at the level of detail,” said Celebrity president Lisa Lutoff-Perlo, who admitted, while leading a tour of the ship, that her two favourite things are the ceilings and the staircases. 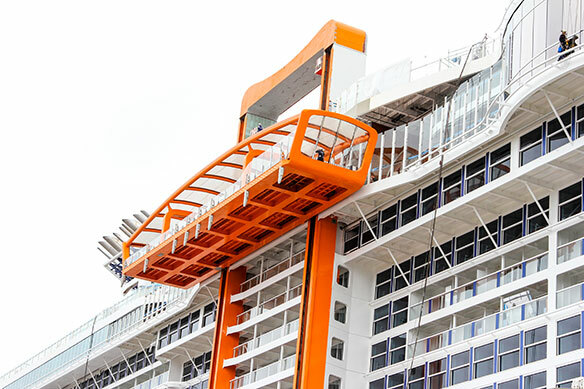 With a design intended to get passengers as close to the ocean as possible, one of the first features you’ll notice upon seeing the Edge is the bright orange Magic Carpet (located on the starboard side), an industry-first 90-ton platform that is cantilevered over the side of the ship and can be moved up and down to serve different functions. At the summit of the ship on Deck 16, the Magic Carpet becomes the ultimate specialty restaurant offering a special “Dinner on the Edge” for 90 guests. Alongside Deck 14, Magic Carpet becomes an open-air expansion of the main pool area. On Deck 5, Magic Carpet extends one of the ship’s specialty restaurants into the most amazing al fresco seating imaginable, and at its lowest position on Deck 2, Magic Carpet is a key component to the Destination Gateway, a luxury embarkation station. The latest Edge “reveal,” which took place at the shipyard, was the amazing Grand Plaza, designed by renowned designers Patrick Jouin and Sanjit Manku of Jouin Manku Studio, who were on hand for the event. Spanning three decks at the heart of the ship, The Grand Plaza – inspired by the piazzas of Italy – acts as the epicentre of Celebrity Edge and will lure guests throughout the day as it transforms both physically and atmospherically. Guests are sure to be drawn to the space by The Chandelier, a striking lighting feature – and art installation – that rises over the Martini Bar to the ceiling three decks above. Composed of five levels of 765 blades illuminated by dynamic LED strips that change colour from day to night, The Chandelier weighs in at seven tons. The Grand Plaza is also home to several new specialty restaurants, including Raw on 5 and Fine Cut Steakhouse on Deck 5, Le Grand Bistro and Café al Bacio on Deck 4, and the new Grand Plaza Café on Deck 3. 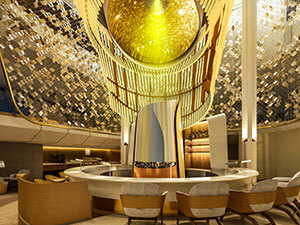 At the centre of the action on Deck 3, guests will find Celebrity’s next evolution of the always-buzzing Martini Bar. In the morning, The Grand Plaza invites guests to enjoy a cappuccino and a croissant at either of the cafés. Later, guests can return for afternoon tea or a pre-dinner cocktail while enjoying unexpected pop-up performances. And, at night, the energy transforms again as the space becomes the social epicentre of the ship, coming alive with live music. While The Grand Plaza is a highlight of Jouin Manku’s involvement in the design of Celebrity Edge, their influence can be felt throughout the ship. Inspired by the thousands of hands that go into the construction of a ship – such as Jouin’s grandfather, who was a welder in the construction of the S.S. Normandie – Jouin Manku was behind the design of the “exposed corridor.” Complete with authentic welders’ touches, architects’ markings and engineers’ notes, the exposed corridor uncovers a stretch of the bare hull of the ship leading to and from The Grand Plaza and the main dining rooms. The space transforms depending on the direction a guest is walking. Jouin Manku’s influence is also apparent in the Main Dining Atrium, where they’ve taken the concept of a staircase and turned it into a work of art. Hanging three storeys between the flights of stairs is yet another meaningful art installation known as The Pendulum. The Pendulum base moves ever so gently to the rhythms of the ocean, reminding guests that they are indeed moving and connected to the sea, even when they cannot see it. Other unique Edge features include a roof-top garden and custom-built launches (or tenders). Accommodation includes the new Edge Stateroom with Infinite Veranda which turns guest quarters into a seamless space, from the room’s door all the way to the water’s edge. The simple touch of a button gives guests open-air access to the sea, bringing the outside in and the inside out. With the touch of another button, guests can take complete control of their stateroom and personalize everything from lighting, shades, temperature and service. The ultimate sanctuary will be the new private utopia called The Retreat, featuring a private pool on The Retreat Sundeck. Also part of this special space is The Retreat Lounge, which brings heightened levels of style and sophistication to Celebrity Edge and boasts around-the-clock personal butler service, and the exclusive Suite Class restaurant Luminae @ The Retreat. 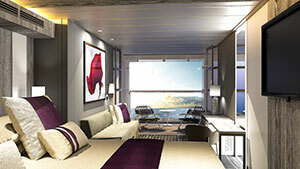 With Edge, Celebrity has more than doubled the number of available suites, adding two new categories. At the top of the line are two new Iconic Suites situated above the ship’s bridge. These near 2,600 sq. ft., two-bedroom, two-bathroom suites feature amazing views thanks to panoramic windows enveloping the dining room, living room and bedrooms. The 700 sq. ft. veranda offers a 270-degree view of the ocean. Another new Suite Class comprises six split-level Edge Villas, which offer stunning views from two storeys of windows, private plunge pools and direct walk-out access to The Retreat Sundeck. When it comes to entertainment, Celebrity Edge is also poised to raise the bar with the cruise line’s most technologically advanced main theatre, the most production shows of any ship in the brand’s history, as well as the largest cast of world-class performers on any premium cruise ship and more entertainment venues than ever before. 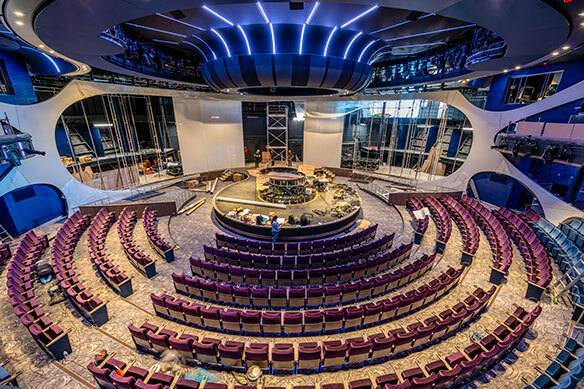 The Theatre on Celebrity Edge throws away the curtain, blurring the line between audience and performance and immersing guests into a unique entertainment experience. With four stage areas and three gigantic, moving projection screens, The Theatre offers an ever-changing canvas for the productions that live here. 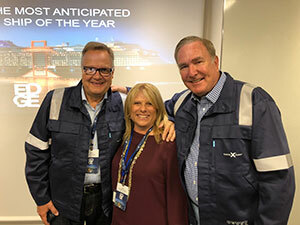 Lutoff-Perlo with Harri Kulivaara (l) and Richard Fain, both of Royal Caribbean Cruises Ltd. The main stage extends into the audience creating a theatre-in-the-round sensation. A duo-directional rotating platform raises almost seven feet above the stage to take performances to a whole new level. And with two rotating spiral staircases, 10 synchronized panoramic projection screens, 16 state-of-the-art video mapping laser projectors, aerial performance rigging, and more, the technology behind the scenes may at times steal the show. At The Theatre, guests can enjoy five new full production shows, including the Shakespeare-inspired A Hot Summer Night’s Dream, where light-hearted theatre meets extraordinary acrobatics; The Jewelry Box, with its jaw-dropping technological feats; Kaleidoscope, a high-energy music and dance extravaganza; and two shows as part of Celebrity’s new Headline Residency program – Get Up, a dynamic pop concert produced by Black Skull Creative, and The Purpose, an uplifting production designed to celebrate the inner self. Another impressive entertainment venue is The Club on Celebrity Edge, a progressive space that changes its persona from morning to, well, the early hours of the next morning. During the day, The Club offers experiences such as the Funovation Laser Maze Challenge, the Drone Hunting laser obstacle course, and more. At night, The Club undergoes yet another transformation. Undercover at The Club puts a contemporary spin on the Prohibition era with 20’s-inspired craft cocktails and an aerial saxophonist. And Celebrity’s Hypno Cam Experience is a first-at-sea dance party featuring a high-tech camera that’s passed around to capture photos, which are instantly displayed on a giant LED screen. For young cruisers, there’s the fully customizable Camp at Sea program featuring more than 500 activities, including Celebrity’s first youth coding experience at sea, and two completely separate contemporary spaces, one for the kids and one for the teens. Celebrity has infused entertainment throughout the ship. At the Rooftop Garden, guests can enjoy experiences such as the Rooftop Concert Series and the Garden Cinema Series, the next evolution of the brand’s Taste of Film experience that’s an under-the-stars movie-going experience with live musical performances. Eden is a unique venue where state-of-the-art design is fused into every element, including cuisine served by “Edenists.” Spanning three decks at the aft of the ship with almost 7,000 sq. ft. of glass, Eden has more outward-facing glass than any other room at sea. As dinner comes to an end, guests will be prompted by sensory cues to tempt them back upstairs, past the Tree of Life to Deck 5. Here, the Library of Plants towers 18 feet above Eden Bar, offering its bounty of fresh ingredients and garnishes for hand-crafted, artisanal cocktails. The Spa on Celebrity Edge offers more than 22,000 sprawling square feet of space. The Spa was inspired by nature and designed by world-renowned designer Kelly Hoppen. Among the Canadians on hand for the Edge event in France was Ensemble Travel Group co-president Lindsay Pearlman, who shared his thoughts with Travel Courier. which can also be booked as back-to-back sailings for a 14-night journey.